Visit Bluefin at 2016 G-FEST!! Anaheim, CA – Bluefin, the leading North American distributor of toys, collectibles, and hobby merchandise from Japan, Hong Kong and more, announces its participation at the 2016 G-FEST with something very special to be showcased at the largest event devoted to Godzilla and Japanese movie monster fandom. New from Bandai, the Gigantic Series Godzilla 1995 is a massive rendition of the famous monster as he was depicted in the movie, Godzilla vs. Destroyah. Production is limited to only 500 units worldwide and the release is available exclusively from Bandiai’s official North American distributor, Bluefin. Standing nearly 2 feet tall, the Gigantic Series Godzilla 1995 will be displayed and also will be available for purchase at G-FEST. A special Bluefin unboxing video showcasing the Gigantic Series Godzilla 1995 is available HERE; a Bluefin comparison video highlighting the Gigantic Series Godzilla’s extraordinary level of detail and other features is available HERE. G-FEST is the largest annual gathering of Godzilla and Japanese monster fans in the world. G-FEST XXIII and is being held this year from July 15th to July 17th, 2016 at the Crowne Plaza Chicago O’Hare in Rosemont, IL. More details on G-FEST are available at: http://www.g-fan.com. 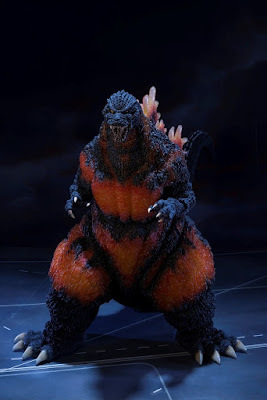 The ultimate version of Godzilla from the movie, ‘Godzilla vs. Destroyah,’ where he burns up just before meltdown. Standing over 19 inches tall with a width of over 35 inches to the tip of his tail, this sizable rendering delivers some serious size to any Godzilla collection! Add him to your collection now before he melts away forever! In addition to the Gigantic Series Godzilla 1995, Bluefin also will offer a variety of other monster-related products for purchase at G-FEST, including its popular line of poseable S.H. Monster Arts kaiju figures from Tamashii Nations.